Services provision is considered as one of the main factors for a successful investment environment, so GOI has been serious to pay much attention to provide best services as it plays an essential role to achieve productivity and social stability. The Government of Iraq has always sought to ensure the provision of good services and infrastructure and to display investment opportunities to the private sector with circulating a number of successful policies and programs in this regard. 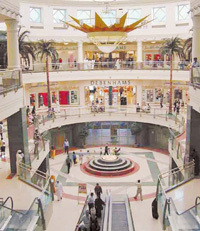 After the restriction to regional traditional markets, Iraq markets have witnessed a big expansion with a shift in consumption, purchasing and entertainment patterns due to opening investment doors in this vital sector and the orientation towards constructing new commercial centers the matter that led to the large increase in the number of the commercial malls in the last three years with more new ones that are still under construction.